You are here: Home / News / Apple iPad 2017 Is The Biggest Surprise of The Year. Apple iPad 2017 Is The Biggest Surprise of The Year. (ThyBlackMan.com) Apple customers stand on their toes whenever their beloved brand announces a brand new product. Recently, the Cupertino-based company has confirmed that Apple’s new iPad, yes it’s called an iPad with no suffix is now available to buy. When everyone was eyeing up on the Apple’s announcements, the new iPad 2017 turned out to be a huge surprise. Apple has discontinued iPad Air 2 which was launched at a price of US$399. And in a surprising move, Apple is selling iPad 2017 at a starting price of US$329. Undoubtedly, the price of Apple iPad is making headlines all over the world, but the low price comes with a catch. Do you find any improvements? If you ask us, the answer is yes, we have found some. As said earlier, the price tag comes with a catch. The changes Apple has made in its iPad are not significant. If you are expecting Apple to have some innovative approach towards the new iPad, the latest release may disappoint you. But as we said that there are improvements, so here’s what Apple has done with iPad. Storage Capacity: Apple has doubled the storage capacity in the iPad. The Apple iPad is now available in two options that include 32GB and 128GB storage capacity. It is obvious, since the last year, the company is following this pattern throughout its product range that includes iPhone as well. So, now there will be no 16GB or 64GB options available for the customers. Processor: Other than the price, the use of 64-bit A9 chipset is the biggest change made in the iPad this year. As Apple has shifted its focus from A8X chip, which was used in iPad Air 2, users will surely experience faster processing speed with the new iPad. For the first time, Apple used A9 chip in the iPhone 6S and 6S Plus giving the devices 70 percent more CPU performance and it also dramatically increased graphic processing power by 90 percent. 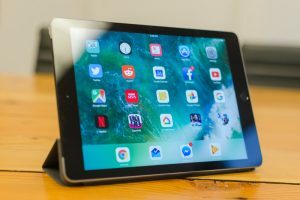 Battery: The new iPad has also got its battery improved, but the company says that the new device will last for 10 hours when the battery is fully charged. With the Air 2 also, Apple claimed to give the same battery backup, so it is better not to expect any significant rise, but as the company is using the improved battery, it will possibly add a few minutes to battery life. Design: No, Apple hasn’t made any improvements in terms of design. In fact, it is really hard to distinguish between Apple’s iPad and iPad Air 2. However, there is a slight difference in the design which appears due to the thickness of the new iPad. When the entire tech industry is aiming to reduce the thickness of gadgets, surprisingly, the iPad designers had something else in mind. In the new device, the company has added some weight and made it thick. Rest of the dimensions remains the same as Air 2. Yes. Whatever you see above are the only changes Apple has made. From the color choices (Silver, Gold & Space Grey) to screen size, the unavailability of the stylus to display resolution, everything remains the same. Just like its predecessor, Apple iPad also doesn’t feature any slot for microSD cards and sports an aluminum body. The device supports Bluetooth keyboard and also has the same 8MP rear and 1.2MP front camera. Wi-Fi and Wi-Fi + Cellular options are also available at an additional cost of US$100 for each. The new iPad 2017 release has sparked many discussions. The rumor mill is actively hunting for the details about the future of iPad. It is being said that Apple is tired of making iPad and is ready to kill the product line, while, on the other hand, there are discussions about Apple bringing something very unique with the next lineup of products. The official information on the future of Apple iPad is still under wrap. And as far as the Apple’s new iPad is concerned, it is really a great product for those who wish to upgrade or want to join the Apple family within a budget. Shipping for the iPad Air 2 successor is scheduled to happen in April. Note: Still surprise in 2017 people are using tablets in general. With that more of a Samsung fan then Apple. Well I for one will be upgrading. Still with that I miss the old Apple. I know nothing stays the same, but Steve Jobs imprint on this company can’t be denied.